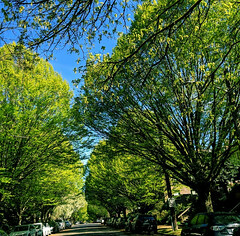 Image courtesy of Chun Kwan, SDOT. Approximately 250,000 people commute to and through downtown each day. 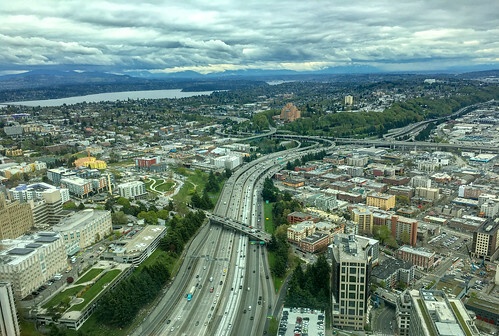 With the new SR 99 tunnel now open, we’ve been analyzing the data from the closure to understand what went well, how we could have done better, and how we can keep the good changes going during the next chapter of the #SeattleSqueeze. Our entire region came together to take on this challenge and be part of the solution. Here are the results in a nutshell: people drove less, took transit, and biked more. Read on!
. 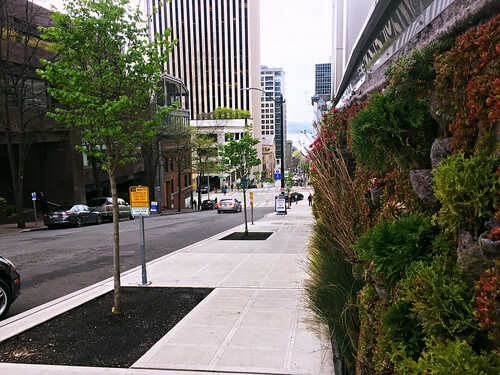 D R I V I N G .
One of our goals during the SR 99 closure was to prevent gridlock by having fewer cars downtown. We can’t say it enough, Seattle, we couldn’t have done it without the collective whole working together. 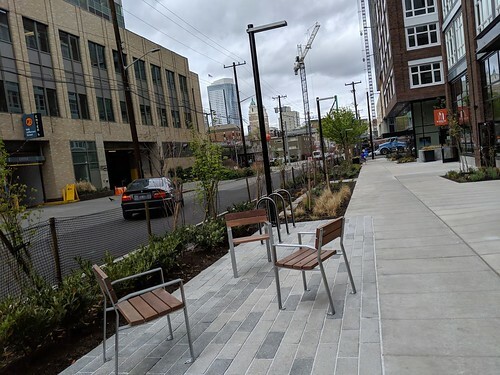 We were able to produce comparable data by counting vehicles that came into downtown Seattle from location points north (at Mercer St) and south (at Holgate St) into the center city and compared the numbers to a baseline period back in September 2018. 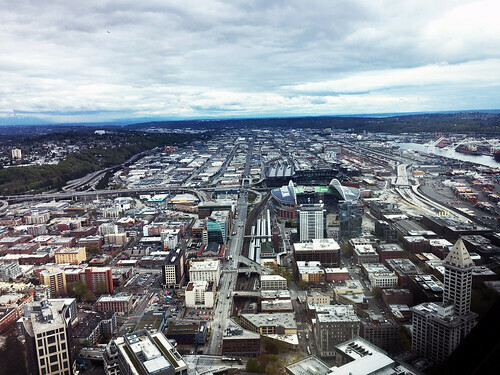 For every single day that SR 99 was closed, fewer vehicles drove into downtown. See that blue line in the data graphic to the right? That’s the baseline volumes in 2018. The green was the daily volumes during the three-week SR 99 closure. You’re the best, Seattle.
. T R A N S I T .
People took transit and shifted their commutes. King County Metro tracked daily ridership along major corridors and on the water taxi. 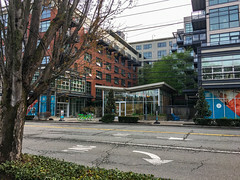 Bus and water taxi ridership varied during the closure, but ridership increased during two of the three weeks compared to January 2018. During each week of the closure, the percent of riders during the midday was higher as compared to the same month last year. That means there was a shift from commute times out of the peak/rush hours towards the midday. 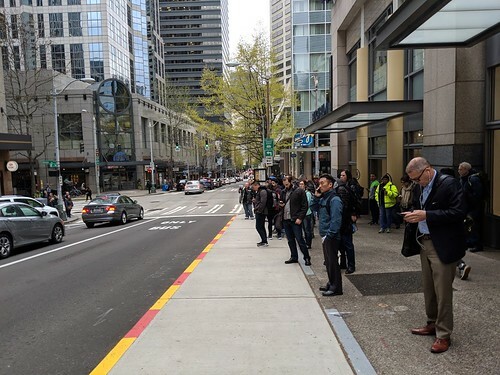 Sound Transit’s Link light rail ridership during the three-week viaduct closure was up 14 percent from last year, to more than 79,000 daily boardings.
. T E L E C O M M U T I N G .
People changed their work schedules. Based on a survey of some of the largest downtown employers, people used telecommuting as a great way to reduce commute trips downtown. We launched an Alternative Work Arrangement Pilot for Chapter 1 of the Seattle Squeeze. The City previously had 12.5 percent of employees that had alternative work arrangements, which included telework or flexible work hours. Now, 30 percent of Citywide employees are participating in alternative work arrangements, with 38 percent in the downtown core.
. B I K I N G .
The number of people biking to and through downtown increased during the SR 99 closure. 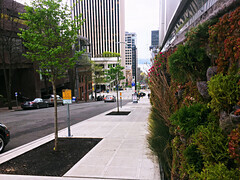 We installed bike counters at the Spokane St. Bridge, the Fremont Bridge, the Elliot Bay Trail, and 2nd Ave downtown. We saw 40,000 more trips in January 2019 compared to the same time in 2018. 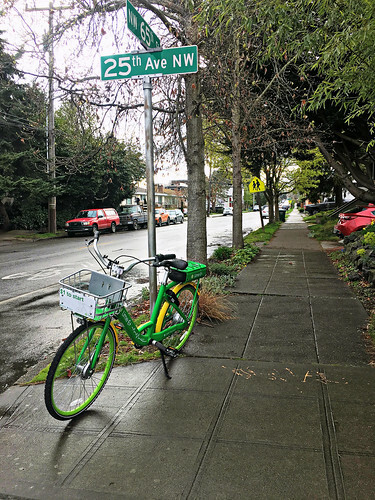 We also expanded our free-floating bike share program and made it permanent. Our data shows that change paid off; we also saw a significant increase in people who used free-floating bike share. Peek the bike share data!
. I N F O | C O N T A C T .
Keep up with all things #SeattleSqueeze by visiting our website. 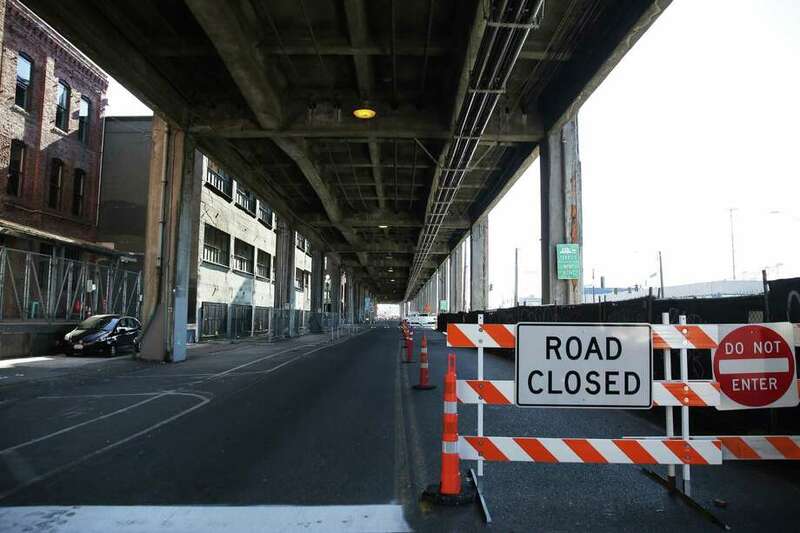 Read WSDOT’s Blog on their Alaskan Way Viaduct project website for the latest updates on the #Realign99 closure. Follow WSDOT on Facebook and Twitter for the latest construction news! Read King County Metro’s Blog, Metro Matters, for the latest updates on ridership numbers on King County Metro buses, water taxi, and carpool/vanpool users. You can also follow King Country Metro on Facebook and Twitter! Read Sound Transit’s Blog, The Platform, for the latest updates on ridership numbers on Sound Transit buses, Link Light Rail, and Sounder Trains. You can also follow Sound Transit on Facebook and Twitter! Read Community Transit’s News Releases for the latest updates on ridership numbers on Snohomish County transit. You can also follow Community Transit on Twitter or on their Community Transit Blog! 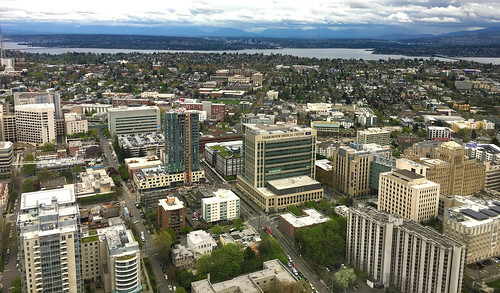 For information, tools, current traffic, and resources for all things #SeattleSqueeze, visit our website! TOP 6 things you can do to avoid #SeattleSqueeze traffic. Friday: meh, great final drive and fireworks . . .
Tuesday: much worse than Monday. Thursday: who knows? But you can make help make a difference. 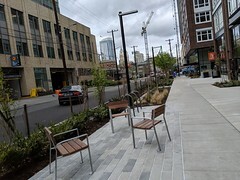 Over the next three weeks or so, the City of Seattle and the region will continue to feel the effects of the Alaska Way Viaduct. This major connection of the State Route 99, which served as a trusted daily route through the City of Seattle for millions since 1954 is gone forever (insert tear), as part of the Washington State Department of Transportation’s work to #Realign99. As we await the opening of the brand-new tunnel, the traveling public still needs to travel but more conservatively. 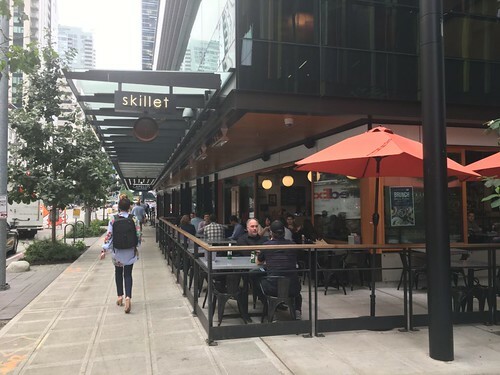 For now, the best way to maintain Seattle’s transportation system and traffic flow is by reducing the number of vehicles on the road in downtown Seattle. Now for some us, this is an easy fix. 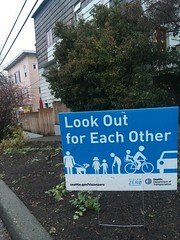 But for others, work, family, health, and other life circumstances simply won’t allow for such an adjustment, which is why those who can must do their part to help maintain traffic flow and be a good neighbor to fellow Seattleites and King County neighbors who must hit the road each day, with no exceptions. 1. Be an Early Bird: Leave home early. Consider leaving at least an hour earlier during the morning commute. 2. 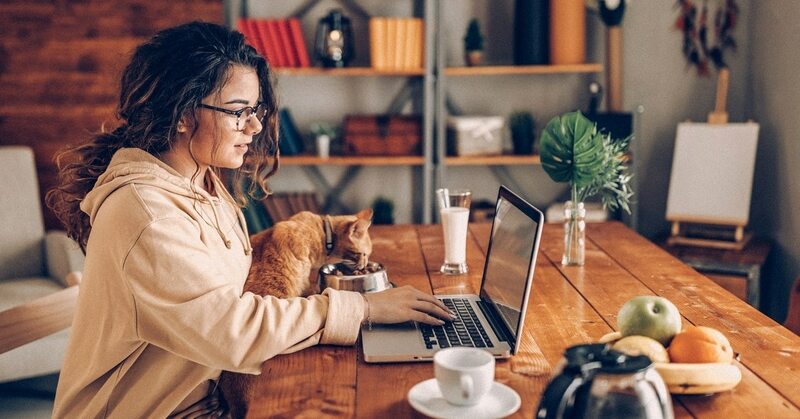 Be a homebody: Work from home. If your employer is amenable, give it a go. 3. Get in Earlier or Later: Alter your work schedule. Check with your employer to see if you can arrive to work earlier and so you can leave earlier. Or the opposite. Schedule that happy hour with friends! 4. Travel in a group: Carpool with friends and neighbors. Organize a group going in the same direction during the week to take one vehicle. We have a list of bike and car share and carpool partners on our website. 5. Be multimodal: The possibilities are endless. 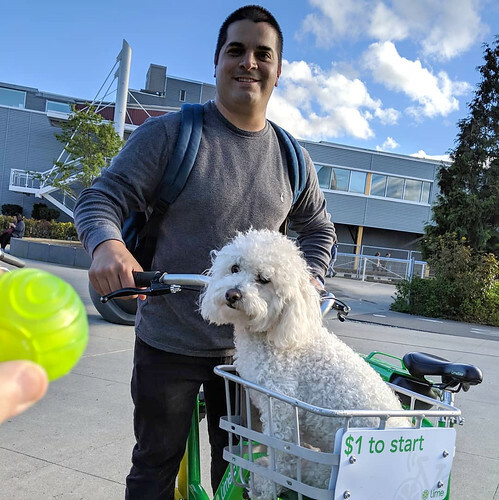 Map out various ways to get there with a combination of walking to public transit, biking to public transit, park and ride and maybe reverse it all in the right order and transportation mode that works for you. 6. Take a post-holiday vacation. You deserve it! For more tips and tools, visit our website! Squeezing in the rain. What’s a little water? BIKE and WALK MAP. Take a look! Image by REI via http://bit.ly/2ssznbw. Plan ahead. This tip is an easy one. So you know it’s going to rain. Pack a lightweight waterproof shell for both your upper and lower body. This way, if it rains for your commute, you’re ready to go. Switchback Travel just released their top rain jackets of 2019. Also, if you have no idea where to start with rainwear, REI has a helpful writeup about rainwear basics – How to choose rainwear. Start here and slowly begin adding to your rain gear. For now, this is a good start and you don’t have to spend a fortune gearing up. Don’t forget, you can always grab cheap gear at a second-hand store. We can’t stress it enough, no matter if you’re walking or biking, light yourself up! Being seen is key especially when it’s a double doozy like a.) being a dark winter month and b.) low visibility with rain. Help yourself to some #FREE ped/bike lights we have here at the transportation mothership (SDOT). We have both white steady lights for the front of your bike or body and red flashing ones for the back. We care about you, so get your free lights already. Contact our Vision Zero team. Also, pretty please, if you’re planning to ride your bike or a bike share, please, pleeeease wear a helmet. 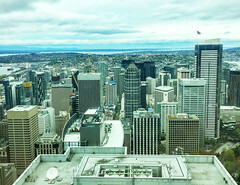 Statistically, if you live in Seattle, odds are you’re one of the brightest people in America, so protect that brain! One last thing, don’t be afraid to be #SeattleForward, make eye-contact with other fellow humans on various modes. It’s ok, look them in the eye, give them a wave, throw them the peace sign. Whether you love it or hate it (or love to hate it? 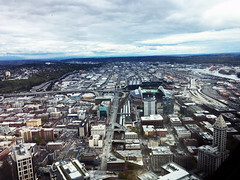 ), Seattle wouldn’t be Seattle without our grey rainy days. We got this, Seattle. It’s time to #Squeeze in the rain! Seattle – newsflash – is still growing. Our city’s population hit an estimated 713,000 in 2017*, a 1.8 percent increase (9,000 people) over 2016. We continue to be one of the fasting growing cities in the country, with more residents and jobs moving to the area. Fewer people driving alone to work downtown. Woot! Sidebar, we’re going to need to see that trend continue (read Period of Maximum Constraint and the new www.seattletraffic.org/). As we grow, we’re also continuing to see safety trendlines head in the right direction, toward zero fatalities and serious injuries. There’s more work to do, for sure. A key ingredient to making more progress is through data collection and analysis. Good news is we collect a lot of data here at SDOT 🤓, and we use it to guide changes to city streets – to make them safer for all, and to make them work harder and more efficiently to serve a growing population. 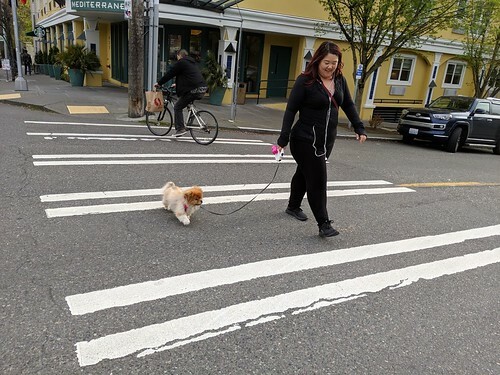 Every year, we pull together a traffic report that provides an update on our core data sets – traffic speeds and volumes, reported collisions, walking and biking counts. Numbers are in for the past year (2017 data). We’ve pulled out some highlights below and you can find the full report at www.seattle.gov/transportation/document-library/reports-and-studies. — In 2017, 19 people were killed. These numbers are headed in the right direction – and we are one of the safest cities in the country – but one death is one too many. We continue to focus improvements on streets where the most serious and fatal injuries occur. More people ➡ more people walking. The general year-to-year trend is increasing pedestrian volumes. 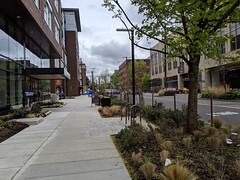 We conduct quarterly counts, and the busiest pedestrian location counted in 2017 (and 2016) was Broadway and E Olive St, with 28,899 people walking there last year (up from 22,539 in 2016) 😮. Pedestrian safety. 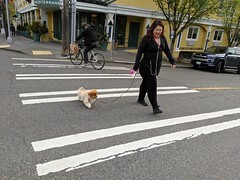 The pedestrian collision rate is decreasing (6.5 percent from 2016) – but the number of pedestrians killed increased from 5 in 2016 (25 percent of total fatalities), to 11 in 2017 (58 percent of total fatalities). Issues like impairment, speeding, distraction, and failure to yield to pedestrians continue to be the primary contributing factors. 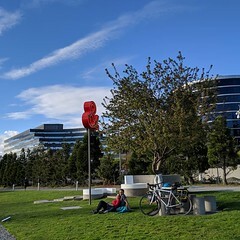 Bicycle volumes are down. Ridership decreased from 3.5 percent in 2016, to 2.8 percent in 2017. But let’s remember ridership is influenced, at least in part, by weather. Last year, we saw 48 inches of rain (our average is 37.5) 😱 and colder than average temps, too. Though it’s not all bad news. From July to December 2017 (during our free-floating bike share pilot phase), people took just under half a million bike share trips! We’re pleased to report that as Seattle grows, we’re continuing to move more people and goods in and around the city safely. 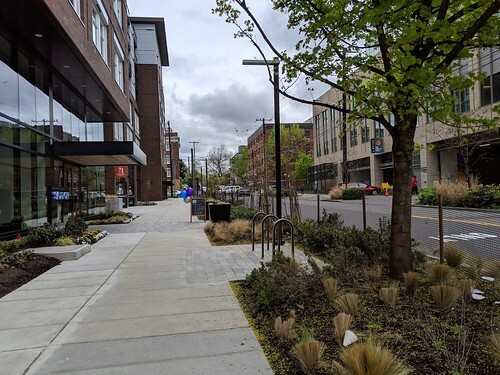 As we mentioned earlier, we’ll use this data to inform decision making around how we adjust city streets – from lane markings to signal timing, and more. You can find the full 2018 traffic report at www.seattle.gov/transportation/document-library/reports-and-studies.